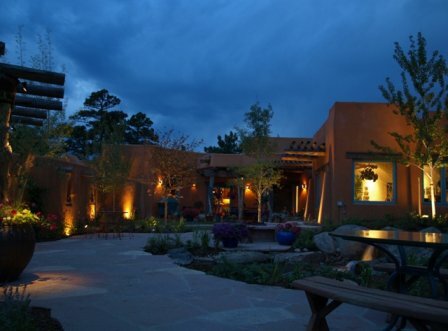 Inspired by the architecture of the Pueblo Indians, the Moore House was designed by Doerr Architecture to create more energy than it uses, a net-zero energy home. Mike and Ann Moore had property at almost 8000 feet elevation in the Rocky Mountains of Evergreen, Colorado and wanted a 3500 square foot home with space to show their art collection. 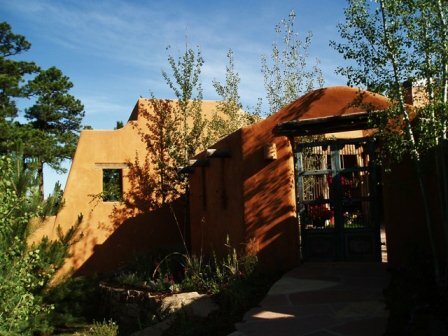 They wanted a home that captured the feel of adobe architecture as well as the views of the continental divide while treading lightly on the earth. 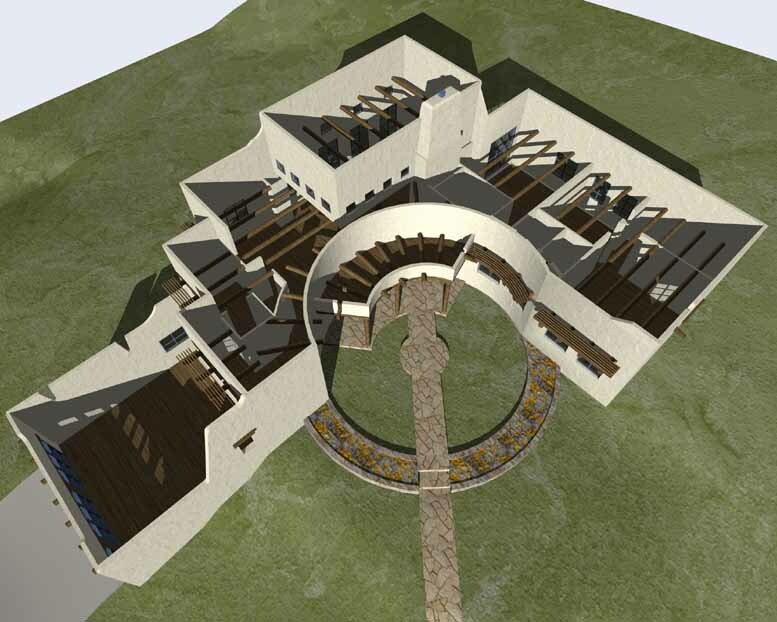 Alluding to southwestern architecture, architect Thomas Doerr composed simple forms that have flat roofs, plaster walls, vigas (rough log beams), turquoise-colored window frames and a circular courtyard reminiscent of Native American spiritual spaces called kivas. 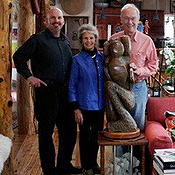 Architect Thomas Doerr with clients Ann and Mike Moore. Photo by C. Lomond. Used proper building orientation, thermal mass and windows to allow the sun to heat and cool the house cleanly and for free. Clearstory windows allow natural convection to exhaust hot summer air high and bring in natural sunlight to the living and dining rooms. Walls of 7” spray foam insulation plus 1” rigid for thermal break, R-30; air changes of 0.07 NACH; quadruple glazed windows. 180 evacuated tubes feed a 2000 gallon tank (reclaimed stainless steel milk tank) to supply both hot water and supplemental heat for the home by use of a water-to-air heat exchanger and radiant floors. Generates more carbon-free electricity (14,400 kWh per year) than the house requires. Instead of using batteries, this grid-tied PV system will spin the electric meter backwards. Air will be pre-heated in the winter and pre-cooled in the summer as it is routed through 300 feet of duct in the earth. Will save most of the heat from exhausted air in the winter. Although energy-efficient design would minimize glass on eastern and western walls, the Moores wanted to maximize their view of the continental divide to the west. To capture this view while rejecting the western heat Doerr Architecture ‘tuned’ the windows with double heat-reflective glass. The US Energy Star program states that a standard new home has a HERS (Home Energy Rating System) score of 100. The better a home performs, the lower its HERS score. The green building strategies used on the Moore Studio earned it an amazing and verified HERS score of -3; one of a few houses in the US to ever do this. 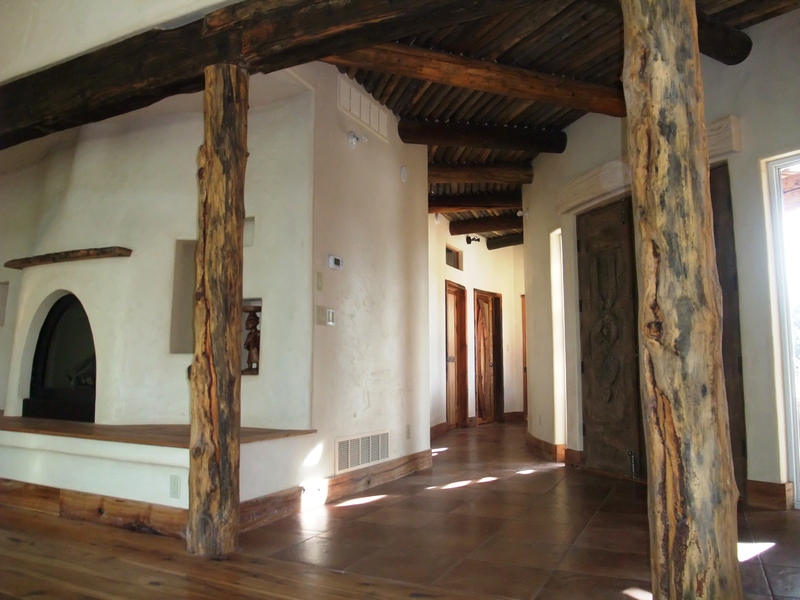 To conserve trees and add character, beams were salvaged from demolished buildings. Special columns and vitas were salvaged from local beetle-kill trees and flooring was salvaged from Revolutionary War barracks. All other lumber is certified by FSC (Forrest Stewardship Council) to be sustainably harvested. To conserve water, the builder, Ecofutures, installed a system that takes grey water from sinks and baths, filters it and supplies it to toilets. 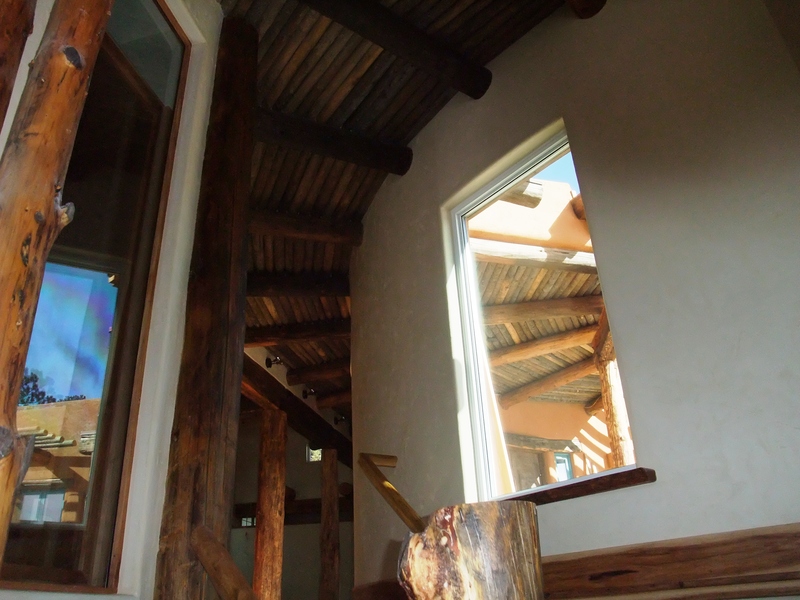 This house was featured on the Colorado Renewable Energy Society’s 2010 Denver Area Solar and Green Home Tour, and in the videos The Net-Zero Energy Moore House and the Passive Solar Simplified.